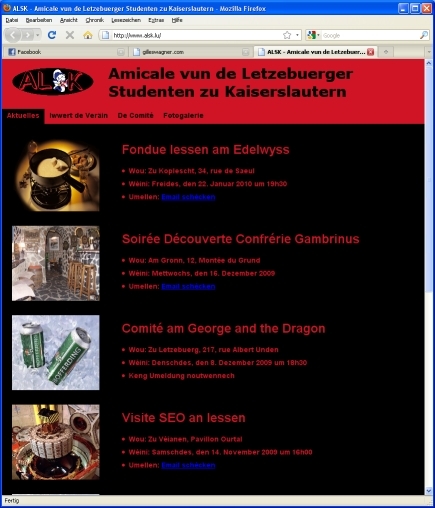 I created this website in 2009 for the "Amicale vun de Letzebuerger Studenten zu Kaiserslautern" and still maintaining it. The goal of the organization is to keep up the ties between the former students of the University of Kaiserslautern that come from Luxembourg. Regularly events are organized and also meetings with the current students in Kaiserslautern. You may see photo galleries of these events and download the reports of the meetings. This is a project I participated in in highschool. It's a collection of latin inscription that you can find on buildings throughout Luxembourg. 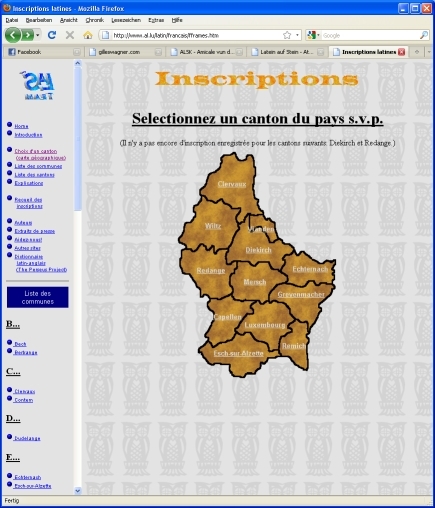 The inscriptions are translated and presented with historical explanations on this website. I worked on this project from 1996 to 1998. After that, the maintenance was given to other students of the highschool.